Propane delivers a clean, cost-effective, efficient and reliable energy solution. Families around Southern Maryland are using propane in and around their homes furnaces, water heaters, cooktops, outdoor grills, fireplaces, generators, and other appliances. Propane is helping Maryland residents shrink their carbon footprint by providing a “green” solution for the environmentally conscious consumer. Choosing this clean-burning fuel minimizes air pollution. SJ Johnson, Inc. of Southern Maryland offers two propane services. Propane installation and propane delivery services. Let us bring comfort to your home year round! SJ Johnson, Inc. offers commercial and residential propane delivery services. Anyone can deliver Propane. SJ Johnson, Inc. company delivers comfort year round! Same day deliveries are available if we are still in your area, if we have left your area you will be scheduled for the next day. Cash on Delivery (COD) accounts available or welcomed! Automatic: You will automatically receive delivery without having to phone in a request. You will have priority over all other accounts whether it is for burner service or fuel oil delivery. You will have the added piece of mind of knowing whatever Mother Nature brings, you will be warm and cozy. All deliveries will be billed to a credit card on file. Will Call: You are responsible for calling in a delivery request. All deliveries will be COD only. All personal checks must have a Maryland driver’s license number on them or delivery will not be made. COD or credit card over the phone. We accept Visa, MasterCard, and Discover. SJ Johnson, Inc. gas technicians can repair or replace propane devices, deliver and set tanks above ground and underground, and run lines inside and outside (your home or business). We also hook up propane-fired generators. Our technicians are both licensed and insured for the state of Maryland. We conform to all NFPA 54 and NFPA 58 codes in addition to all local plumbing codes. We would like to work with you and find the best option for you propane needs. S J Johnson can accommodate any of your propane needs in anyway, no matter the size of the project. We offer a number of tank sizes to best fit your needs. 60 gallon or 200lb tank: Best for single low volume appliances. E.g., cooktop or water heater. 120 gallon or 420lb: Best for medium use appliances: E.g., fireplaces. 120 gallons tanks can be doubled up for more capacity E.g, (2) 120s = 240 gallons. 120s can be set next to house with some restrictions. Please call S J Johnson for a FREE site survey – (410) 257-2515. 250 500 and 1000 gallon tanks: Best use for multiple appliances and bigger homes. All of these tanks must be 10′ from your home. These tanks can be buried or above ground. Tank size is determined by total number of BTU’s needed for all appliances being used in your home or business. Please call S J Johnson for a FREE site evaluation – (410) 257-2515. 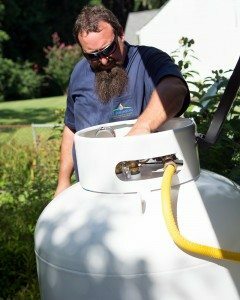 Due to expansion, propane tanks are only filled to 80% of their stated capacity. Who should have Carbon Monoxide Testing? Anyone who has a propane or oil burning appliance needs to have annual check ups to monitor and prevent carbon monoxide poisoning. Hot water heater, furnaces, stoves, fireplaces etc. all need inspections, and all homes using oil or propane need a carbon monoxide detector that we can install at the time of inspection if you do not have one. Carbon monoxide is odorless and colorless. Carbon Monoxide will be present in your home and you not know until its to late. Please protect you and your family by scheduling an annual check on your appliances with SJ Johnson today. The Propane Education and Research Council (PERC) has information for consumers covering a wide variety of subject areas. Visit PERC’s UsePropane.com website for information on consumer safety, emergency preparedness, homeowner safety information, and building with propane. Check out our Propane FAQ section to answer any propane questions you have. Error: Error validating access token: Session has expired on Sunday, 10-Feb-19 16:22:15 PST. The current time is Sunday, 21-Apr-19 20:44:23 PDT. Chance of late night showers. Lows overnight in the low 60s. Partly cloudy. High 77F. Winds light and variable. Plentiful sunshine. High 76F. Winds NE at 5 to 10 mph. Except for a few afternoon clouds, mainly sunny. High 76F. Winds ENE at 10 to 15 mph. BILL PAY NOW AVAILABLE ONLINE! Theme customized by Daniel C. Palmer. | Marketing & Search Engine Optimization by adPRO. on demand hot water heaters installation, HVAC installation and repairs, mini splits installed and repairs, heating and air Conditioning services, swimming pool water delivery, sand delivery, and more comforts for your home or business. SJ Johnson service areas; Calvert County, St. Mary's County, Charles County, Prince Georges County, Anne Arundel County and more throughout Maryland.